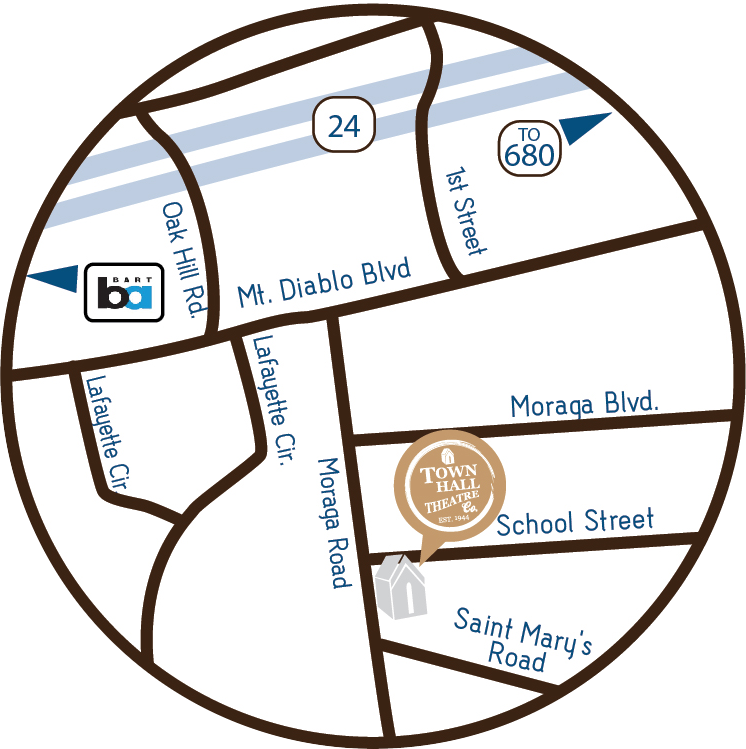 We are located at 3535 School Street at the corner of School Street and Moraga Road in Lafayette. 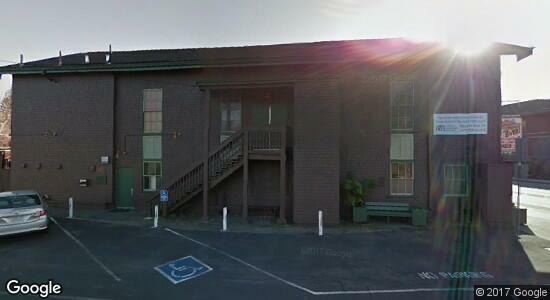 The theater is a two-story brown building at the corner of School Street and Moraga Road, at 3535 School Street. Street parking is available on School Street, but can fill quickly. Alternate options nearby include: the underground parking lot across the street at 911 Moraga Rd or the outdoor paid parking lot located at 945 Moraga Rd (about a 2min walk away ). We do still recommend arriving early. Take Highway 24 East through the tunnel toward Walnut Creek. Take the Central Lafayette/Oak Hill exit. At end of exit, turn right on Oak Hill. Turn left on Mt. Diablo Blvd, at the light. Drive one block, then turn right on Moraga Road at the light. Drive about five blocks, then turn left on School Street at the light. The theater is a two-story brown building at the corner of School Street and Moraga Road, at 3535 School Street. Ample street parking is available on School Street. Take Highway 24 West toward Oakland. Take the Central Lafayette exit. At end of the exit, turn right on Deer Hill Road. Then take a right onto First Street and go under the freeway. At the light, turn right on Mt. Diablo Blvd. Immediately get into the left lane. Turn left at Moraga Road at the light. Our seating capacity is 185. Wheelchair accessible. We have an elevator in our lobby that goes directly upstairs to our theatre. Disabled parking space are available on a first come first serve basis. We have wheelchair accessible seating in our theatre; please call to ensure this is handled by our staff. Those specific seats are: A 11 & A 13 : open space available that fit two wheelchairs; and A 1 & G 1 : seats in our house with a raisable arm. Late Seating. We do our best to start shows and events on time. We cannot guarantee latecomers will be seated before Intermission. Subject to availability we may be able to offer you tickets to another performance. Refunds will not be issued to late arrivals. Please come early and enjoy refreshments in the lobby before the show! Theatre Club. What is “Theatre Club”? A talk back following certain performances with the cast and some of the production team. Enjoy a complimentary glass of wine while getting a behind the scenes look at how theatre is made here at Town Hall. Weather. Town Hall Theatre is nearly 110 years old, and doesn't have the best insulation or climate control system. We do our best to keep the lobby and seating areas as comfortable as possible, but advise patrons to dress warmly in the winter and coolly in the summer. Lobby Information/Pre-show Events: One hour before most showtimes we encourage patrons to gather in our lobby with friends and family where we offer free pre-show music and/or activities. Please refer to the Community Engagement page on our website for details. We're green - Town Hall now has a refillable water station! You can either bring your own refillable water bottle from home, use one of the biodegradable cups we provide, or purchase your own THT-branded reusable water bottle at concessions. We have a full bar as well as snacks/desserts for purchase that you can bring upstairs and enjoy during the show!.